Cryptozoology is the study of animals, or creatures, that have been reported to exist without any actual proof. This field of study also includes the search for animals that are thought to be extinct. These strange creatures, like Bigfoot, the Loch Ness Monster, Sea Monsters, el Chupacabra, and others are often referred to as cryptids. Read True Terror is When Your Imagination Turns Into Reality, a story about a young boy's encounter with a strange creature in the woods of New Jersey. Monsters. The very word brings to mind everything from the famous Loch Ness monster to the nameless terrors that lurked underneath your bed as a child. But, where did the these images and legends come from? Are they purely fantasy, or are they based on some darker truth? Let's find out. The Greeks and Romans had a plethora of fantastic monsters and half human/half animal creatures that are now thought to be purely fantasy and myth. But, there have been reports, even as recently as our modern age, of creatures that fit the descriptions of some of these mythical monsters. One of them is the Satyr. Many years ago I came across the story and the pictures of two mummified bodies found over in a part of Europe that bore all the characteristics of what the ancients wrote about satyrs. I was dumbfounded. Both bodies has been extremely well preserved and one was clearly male and the other clearly female. Both bodies had the upper torso of a human male and female, but had long shaggy black hair on the heads with horns protruding from the head and very long canine teeth. From the waist down the legs ended in cloven hooves and was also covered in long shaggy black hair. The bodies had been laid in an underground tomb together in a large stone sarcophagus. The next sort of monstrous creature that has had reported sightings in the last few years comes out of the southwestern part of the United States as well as from the state of Pennsylvania. The witnesses report a great flying beast that is as large as a small private air plane, like a Cessna. The wingspans of these fantastically monstrous birds seem to range from 15 to 20 feet across and the coloration of the feathers ranges from dark brown to black. The head is reported to be very large with a very long and sharply serrated looking beak. The talons are reported to be larger than a big man's hands. When many of the people drew what the saw, the results were astounding. What they drew resembled a pterodon, a beast thought to be extinct for millions of years. The Native Americans have had tales of these monsters for ages. They called them Thunderbirds. What are we to believe? Could these monsters that have been long thought of as myths and legends, or mere folk tales, really exist? For many years it was thought that the tales that sailors brought back from there travels to exotic lands about the great apes were merely tall tales and that they were mythical monsters. As we all now know, they are very much real, although not the monsters the sailors made them out to be. Perhaps the legends are based on fact and the monstrous creatures in these old tales are very real and perhaps a remnant of these seemingly magical and mythical creatures still survive even today. All over the world there have been reports about strange creatures swimming around in the lakes and oceans of our world. Are they real? Or, could hundreds of people be imagining these things? Personally, this writer doubts that every single person has been hallucinating. While there are those who have been caught up in perpetrating a few hoaxes many sightings remain unsolved and unexplained. One of the most well known creatures to have been reported being seen time and time again over, at least, the last two centuries is the famous Loch Ness Monster, affectionately known as "Nessie" the world over. What is Nessie? Is this beast a remnant of the age of dinosaurs? A plesiosaur as many people believe? Many of the eye-witness accounts and descriptions definitely describe just such a creature. Or is it, as some claim, a rather large sea snake? One thing is for certain, something lives in Loch Ness that has amateur and professional cryptozoologists alike captivated and longing to find out what this legendary creature is. Loch Ness isn't the only Lake in the world with a strange creature living in it. Lake Champlain lies between Vermont and New York and goes all the way up into Canada and it has it's resident monster too. The creature locally known as "Champ" has been spotted many times over the last several decades. 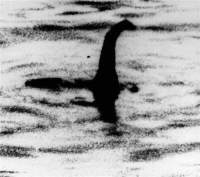 Eye witnesses describe a creature which bears a striking resemblance to accounts given about Nessie. In this modern technological world of ours could there really be dinosaurs left swimming in the vast deeps of the lakes and oceans? This writer finds the idea wonderful and exciting. The sightings of a large, hairy creature that became known as Bigfoot was first reported in the U. S. and Canada in the mid 1800s. 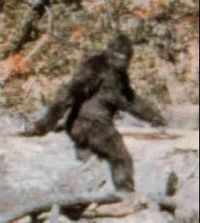 Since that time there have been many hundreds of sightings of this large, hairy ape like creature, and foot prints found ranging in size of 16"-20" in length. There have also been numerous hoaxes over the years, but there are also the various unexplained bits of evidence that suggests some as yet unidentified creature roams the woods and forests of the Great Northwest and Canada. There is some speculation that Bigfoot is a distant surviving relative of an an extinct primate known as Gigantopithecus, which lived in China. The famous home movie shot by Roger Patterson in 1967 is one of the most well known pieces of evidence in favor of the existence of Bigfoot. The chupacabra is a cryptid, or unidentified animal that reportly inhabits parts of both of South and North America. The chupacabra is most often associated with Puerto Rico and Mexico, but has also been seen in parts of the United States, and Russia. "Chupacabra" literally translates from the Spanish as "goat sucker". The creature came to be called the chupacabra because of it's habit of attacking farm livestock, especially goats, and drinking their blood. The physical description of the chupacabra varies. The first sightings of the chupacabra were in Puerto Rico around the early 1990s. In the Americas eye witnesses have reported seeing this bizarre creature as far north as New England, and as far south as Chile. Many swear that the chupacabra is a real creature, but mainstream science and it's experts generally agree that the chupacabra is just a creature of legend, a myth, or even an urban legend. The chupacabra is reported to be a rather thick and heavy looking creature, about the same size as a small bear and it has a row of spines going from the top of it's head to the base of it's tail. Here is an interesting video from You Tube that gives a lot of information and ideas about the Chupacabra. More Cryptids and Strange Creatures Coming Very Soon! Imaginary Friends and Ghosts - Is Your Child's Imaginary Friend a Ghost or Spirit?